Prime Minister Netanyahu, with President Peres behind him. Israeli Prime Minister Benjamin Netanyahu insisted with Prime Minister Joseph Muscat today that it would be a historic mistake if international sanctions on Iran were to be lifted, when Iran was so close to achieving its goal to have a nuclear weapon. Dr Muscat this morning started a three-day visit to Israel and Palestine. 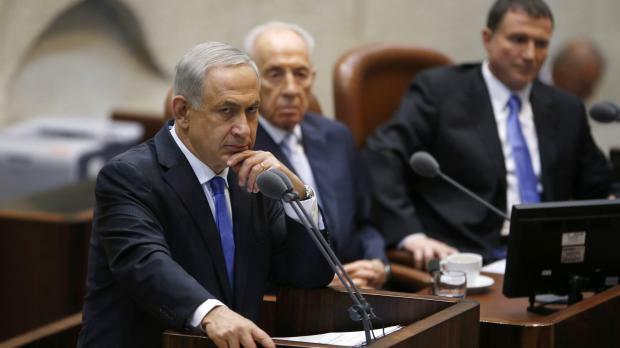 "We want a world of peace and this does not include Iran having a nuclear weapon," Mr Netanyahu said. Dr Muscat said the recent tragedy involving Syrian migrants off Lampedusa underscored the importance of having stability in the region. The two leaders will discuss cooperation between the two countries in various areas including research and development, scientific development, health and tourism. The respective ambassadors, Simon Pullicino and Oren David signed an action plan on health services between both countries. 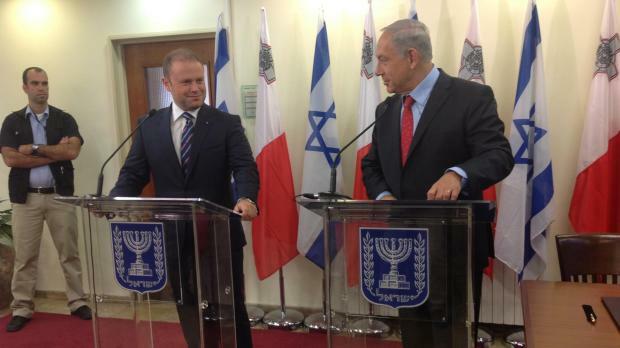 During his visit, Dr Muscat will also meet Israeli President Shimon Peres. He will visit the Knesset and meet the Speaker and also pay his respects at the Holocaust memorial. On Thursday the delegation will cross into Palestinian territory for talks with Palestinian Prime Minister Rami Hamdallah in the West Bank town of Ramallah. The Prime Minister was invited by former UK prime minister Tony Blair, who heads the Quartet tasked with handling the peace process, to visit the team's office in Jerusalem. Dr Muscat leads a delegation that includes Foreign Minister George Vella,Tourism Minister Karmenu Vella and Labour MP Charles Buhagiar, consultant on capital projects. The Prime Minister's wife Michelle also forms part of the delegation after being invited by the Israeli and Palestinian authorities. She will have a separate programme, visiting charity organisations and hospitals. Accompanying the Prime Minister is a delegation from Malta Enterprise and a number of businessmen who will hold meetings with Israeli and Palestinian entrepreneurs. Trade relations between Malta and Israel have grown exponentially over the past three years. Last year Malta exported €84 million worth of goods to Israel, almost 80 per cent being minerals and oil products. Imports from Israel reached €99.6 million. Air Malta operates three flights a week to Tel Aviv, which has boosted tourism from Israel.